Westwater Angling held the first of their yearly open days at Hallington Reservoir last weekend. Head Coach Cliff Johnston is a member of the private trout water and regularly casts a line on its two large lakes, stocked with hard fighting rainbow and brown trout. The day started at 9.30 and was well attended by members and non members. Ken Muter (APGAI), commenced proceedings with a talk on fly fishing tackle and then casting demonstrations of the roll and overhead cast – with tips to overcome what was turning out to be a rather windy day. Cliff Johnston (GAIA), gave a session on entomology, focusing on the natural flies from his kick-sample and the best imitations to use at Hallington Reservoir. This session was complimented with a fly dressing demo by Phil Bilbrough (Chairman of Northumbria Fly Dressers Guild), who demonstrated how to tie the flies to fish at Hallington. The day finished with more casting tuition which included shooting line, false casts and single/double haul casts from Ken. Helen Jobson and I could not resist casting a few lines into the reservoir. We caught and released a total of 12 fish, with one to take home for Helen’s tea. A good day had by all. Sunday and I was back on the Tyne to meet up with a party who had bid for a days fishing on Bywell Beat as part of the Atlantic Salmon Trust Fund Raising Auction. It was a hot sunny day and with low water levels the odds were stacked against us for the prized fish of all, a Spring Salmon. I was guiding Jean and Cecelia who were regular rods on rivers in Scotland. Tactics for the morning session were small flies and slow sink tips. Fishing the bridge and pipeline pools – Cecelia stirred a decent fish – a huge splash got our hearts racing. 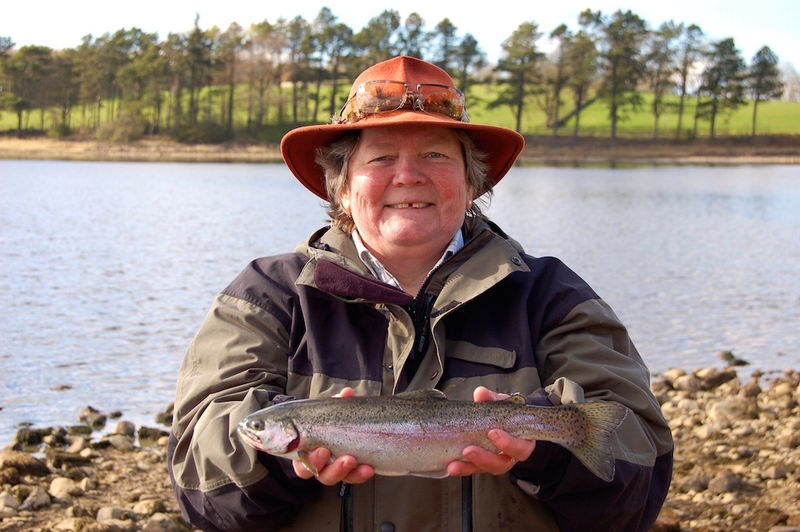 Jean followed a member of the party down the Island pool and hooked into and landed a magnificent Spring Salmon of 21.5lb on a small cascade tube. It was certainly a day when girl power ruled at Bywell. Well done Jean. This weekend sees me travelling to Scotland to cast a line on the Tweed, Tay and Lochy. Good action there Anne, tight lines on the Tweed!